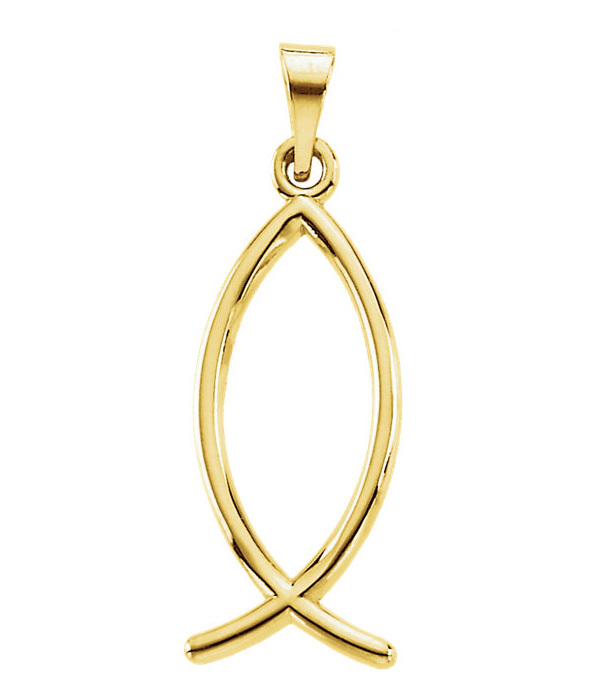 Not only is 14K gold a beautiful and precious metal to have a stunning piece of jewelry crafted from, but when it is paired with such a heartwarming symbol, the Ichthus Fish pendant in 14K gold from Apples of Gold Jewelry will quickly become a pendant that you will wear close to your heart. 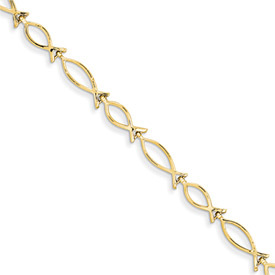 The pendant is made from 14K yellow gold and features a simple design - an Ichthus fish. The pendant measures 3/4 inch tall by just under 5/16 inch wide, and is also available in just under 1 inch tall by 3/8 inch wide. This pendant would look stunning with a variety of chains, whether you are choosing a new chain or one that you already have at home. "Ephesians 4:32 - And be ye kind one to another, tenderhearted, forgiving one another, even as God for Christ's sake hath forgiven you." We guarantee our Ichthus Fish Pendant in 14K Gold to be high quality, authentic jewelry, as described above.